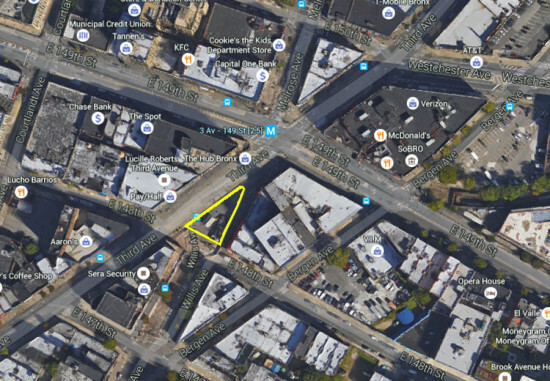 “The Hub,” in the Bronx neighborhood of Mott Haven, couldn’t be better named: it’s the center of commercial activity in the South Bronx, and one of the busiest intersections in the city. 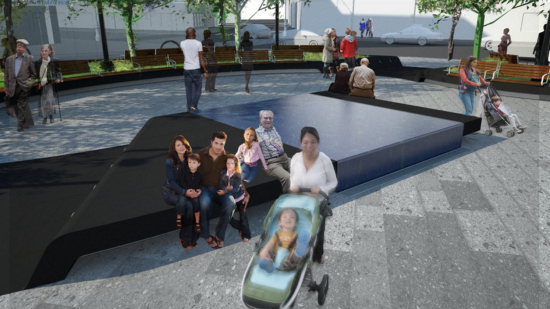 As its dense avenues are packed with shoppers and commuters, the city moved to expand and improve Roberto Clemente Plaza, a public space that’s a respite from the hectic nearby streets. 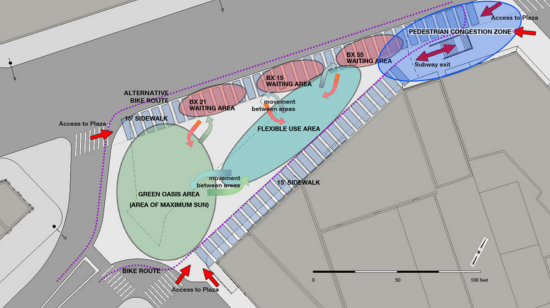 In 2008, the NYC Department of Transportation (NYCDOT) upgraded streets and public space in the area, improving walkability with 15,000 additional square feet of sidewalks, pedestrian islands, and streets partially reclaimed for pedestrians. 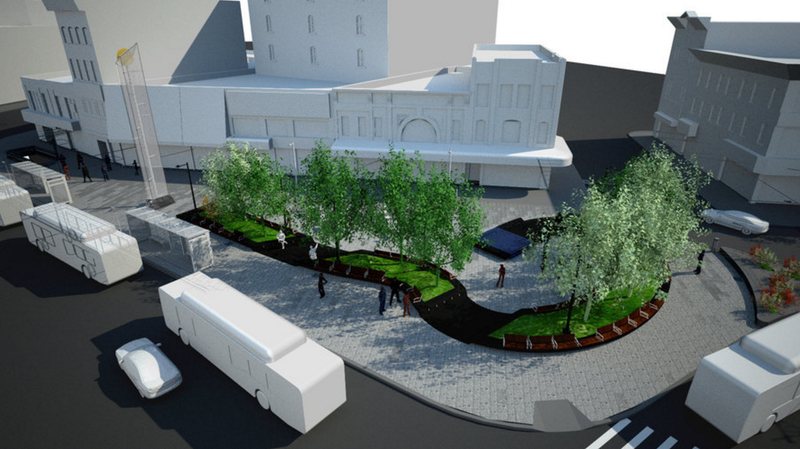 As part of these improvements, the NYCDOT remade Roberto Clemente Plaza, at Third Avenue and 149th Street. 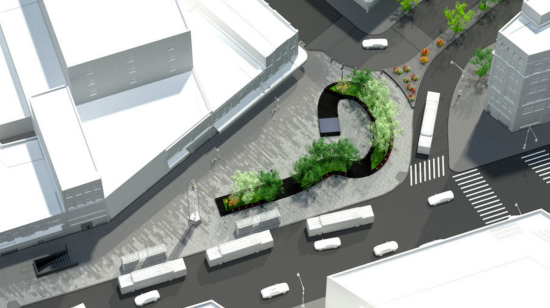 Extra street space was repurposed into a temporary pedestrian plaza with the addition of paint, planters, and gravel. 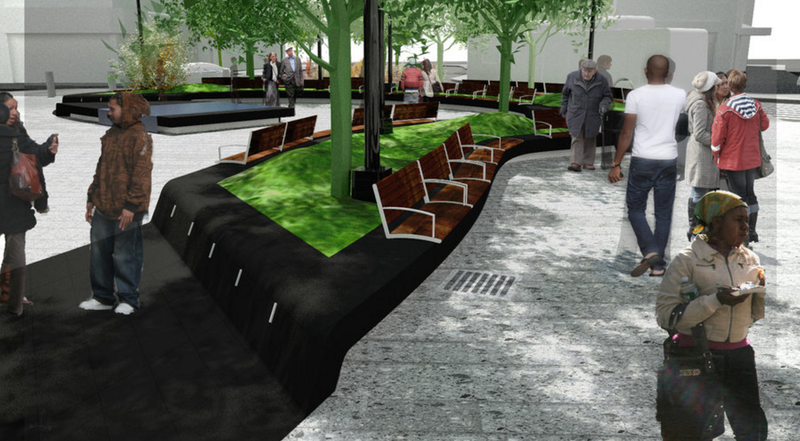 In 2010, NYCDOT passed the torch to the NYC Department of Design & Construction (DDC) Design Excellence Program to create a permanent Roberto Clemente Plaza. The DDC partnered with Brooklyn-based Garrison Architects to design the plaza. Renderings show a curved green strip, lined with benches, that lets plaza visitors take in the streetscape. It’s been over two years, however, since the project with an 18 month timeline began, and there’s no firm end date in sight. The DDC estimates that construction will last through 2017 (though its website says construction will be complete by August 2016). The DDC claims to be “working diligently” with the contractor to minimize further delays.